Celebrate the many wonders of our planet as you observe Earth Day on April 22nd. 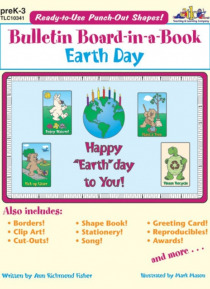 As you talk about this attractive bulletin board and complete the activities on the pages that follow, your students will learn to appreciate the Earth. They will also learn the importance of recycling and picking up litter. Link up with students' families in a parent letter, and practice math and language skills as y… ou attempt to have a Happy Earth Day!